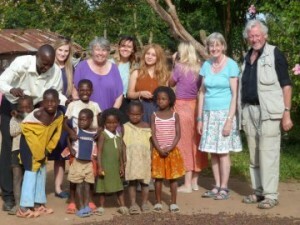 We piloted the first Friendship Programme in November 2009, and it proved to be a great success. In July 2010 we expanded the programme with 8 visitors from the UK, in June 2012 we had a visiting party of 12, including 6 staff and students from Newcastle-under-Lyme College and in 2015 we had visitors from the British Humanist Association, St Louis Ethical Society, USA and Australian Humanist Aid. 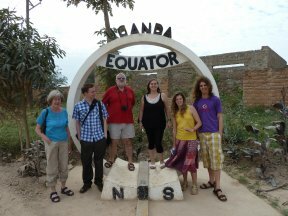 Participants make their own way to Uganda. They stay in basic hotels near the schools. Visitors have an opportunity to contribute to or lead activities that suit their personal interests and talents. The schools favour participatory activities which give students an opportunity to listen to, practice and improve their spoken English and to learn other skills. Activities include short illustrated talks on topics of interest and a range of supporting activities, such as discussion groups, debates, music, arts, drama and sports. There will also be an opportunity to discuss the work and needs of the schools with students and staff. It is clearly a long way to go so most visitors combine their trip with a wildlife safari. One possibility is to share an escorted safari, of which numerous are offered by reputable travel organisations. There may also be the possibility of staying on in one of the schools to help out. You will need to arrange your own travel insurance and flights. A 6-day safari costs around 1200-2000 US Dollars, depending where you go and the standard of accommodation you choose. Hotel accommodation is around £20 per night, though lodges in the game parks can cost $200 a night or even more, but there are tented camps as an alternative. We are willing to make reservations for a simple hotel during the “International Friendship Week”, but ask you to pay for the hotels yourself. You will need to make your own reservations for outside this period – we can provide advice if needed. You will need to pay for local taxis to get to and from the schools each day. We will not be able to handle any money ourselves and participants must come on the understanding that they are travelling independently. Neither Uganda Humanist Schools Trust nor the schools can accept any liability should anything go wrong. You are advised to have adequate travel insurance. The schools will provide daily lunches with local food, shared with staff and students. A donation to the schools to recompense them for these costs would be appreciated by them. Participating in the Friendship Week activities will give you a good insight into rural schooling in Uganda and a feel for their development and funding needs. The students will benefit from having an opportunity to speak with first language English speakers. If you are interested in taking part in a future visit then please get in touch with us.